The shadow of you is the shadow in me. Today is Lunar Eclipse. In Leo. 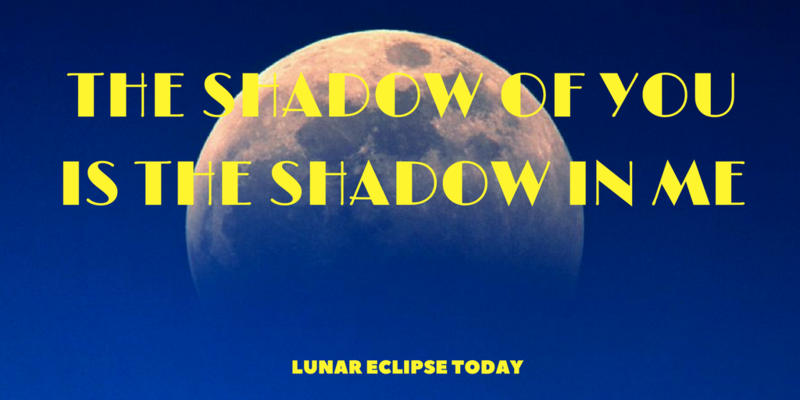 One who can explain the whole astrological meaning much much better than I is Chani Nicholas who gives a shout about how this lunar eclipse is helping us to persist in her latest online post here. Reading her article and surfing through a few others made me think about the actual happening of a lunar ecplipse and how it is a symbol for what is going on in the world right now. The planet earth is coming between the powerful and shining sun and the mirroring moon. She is actually only reflecting the sun that is shining upon her as you all know. This behaviour of the earth getting in between those two actually reminds me a lot of what is happening on earth with us humans – not only lately although it seems to become more obvious in the last months or few years – but actually it might be a metaphor for the overall path we as humans have to overcome. The shadow in you is the shadow in me. Whatever shadow is shining upon the world is a shadow I carry inside myself. Lately when Trump became president it became more obvious than ever before. And since then whenever a new decision comes up that seems inhuman and so wrong, I am remembering again: he is only the shadow of us people. He is the reflection of our own behaviour. How can we stop this? We have to end the reflection of our own shadows. As a collective but also each one of us. This is the hour. We are the ones we have been waiting for! So what can we do. Our task is to look at our shadows and turn them into light. Cross your heart – what are the things you dislike in others. Just think of one person right now. A friend, someone you know, a collegue. Something you find disgusting or disturbing. This is going to be hard, but I have to tell you: as you are resonating on this behaviour, there is something in yourself you are resonating with. We are everything, we carry every different part in us – some are louder some are more quiet. The nice and bad, aggressive and peaceful, happy and sad and so on. What is making our personality individual is mostly about what we allow ourselves to be in the surrounding we live in. Just remember: when you grow up in a surrounding that is more aggressive or tough, you will be more tough yourself. When you grow up in a surrounding that teaches you that you are not good enough you will not have a lot of self-worth and so will be shy or insecure or even depressive. Yes, I know, this is very broken down and generalized but overall it is true. Back to the shadow: thinking of that one person you had in mind just a minute ago. What do you not like about that person? Is it something you also don’t like about yourself? Or is it something you do not allow yourself to be like – maybe for very good reasons? As Deepak said in his article: we will only get rid of the people who are reflecting the shadows in ourselves if we start to love those shadows in ourselves. Yes, we are talking about emotions. Taking Trump as the example here – he is the inpersonated shadow of our society. Not only of the Americans. He is inpersonating how we treat the earth, how we handle consumption, how ignorant and selfish we are with the weaker people amongst us and also the “next generation”. He does not care. Do we all the time? Again, what can we do? How does it work to change our collective shadow? It is a long path. And every one of us counts. I am tremendously happy to see that people are already awakening, standing up, demonstrating, building communities again. But there is much more to do. We have to forgive ourselves. We have to love the shadows within us so these shadows cannot reflect that much and bring people like Trump into power anymore. We have to shine our light to the shadows in ourself. You can start right now. What are your personal shadows? If it isn’t easy for you to think about that – just look around you? What are the shadows other people shine back on you repeatingly. What are typic characteristics that you end up with again and again. Is there a lot of envy shining back on you? Is there mistrust or sadness? What is lying behind those emotions? What do you not love about yourself that is bringing up those emotions? What are you not allowing yourself? Can you accept that, forgive yourself, and even love yourself complete although you might have emotions sometimes that are “not ok”? Everything that you see in others is only a reflection of yourself. Like the sun is only lighting up the moon. While the moon is still there we just cannot see it as long the sun is not shining the light towards it. If we shine our light, if we overcome our own shadows and accept and love us for who we are – and I mean everything that we are – everything around us will be reflected by the light we are. Be the light you want to see in the world!